OK! Everyone is on-board and it has been decided that little “Fido or Fidette” will be going along on the vacation…now what? Well, for me, the FIRST thing to do is get out my suitcase (yes, I travel with my very own full-size suitcase) and start laying everything out that I think I will need for the trip. I will tell you how “I” plan for a trip, but of course, everyone is different so your needs will be different from mine. The very first thing that Mummy and I do is to print off a calendar of the days or weeks that we will be gone. Then on each day, she notes WHAT ACTIVITY we have planned for that day…this way, if someone should ask me to attend an event, I can look at my travel calendar and see if the day is free. Being a FASHIONISTA, the next thing that I do is to start laying out my outfits for each day that I will be gone…including the day I leave and the day I return home. This also includes a matching hairbow and matching leash for every single outfit! Packing for little me is truly a daunting task…it can take a whole DAY for us to do this! Each outfit is chosen depending on the “calendar of events” that are scheduled for that particular day. HEAVENS ABOVE, I wouldn’t want to wear a ball gown to walk 20 blocks to Central Park and then to a Doggie Park!!! The calendar is ESSENTIAL in choosing the correct outfit for the corresponding activity. Some days there are several events to attend, so I might change clothes a few times a day…which means changing hairbows and leashes as well. 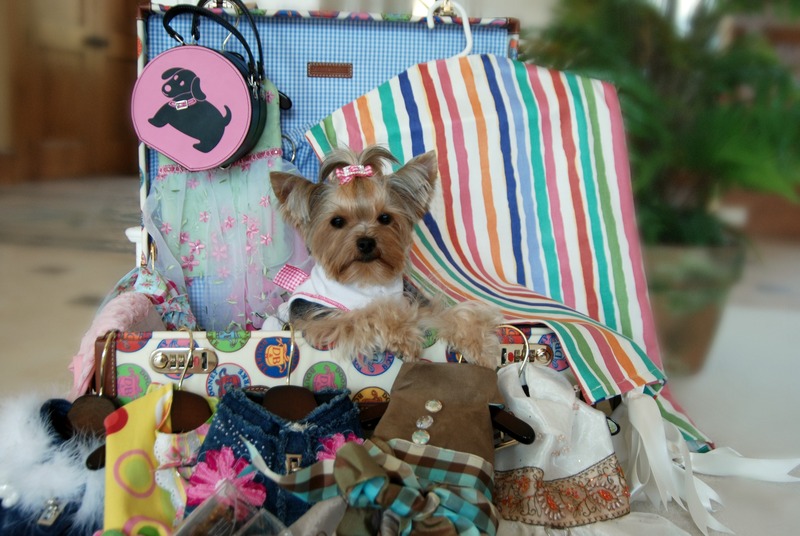 All outfits are placed in daily order, with hairbows and leashes beside the outfit…until the trip is complete. The clothes are all hung on hangers, which makes it super easy to just place them in the closet when we arrive at our swanky hotel….then everything is placed in my own custom-made garment bags (that Mummy makes for me) to keep the clothes from getting damaged in my suitcase! Did I mention that I’m a FASHIONISTA?!?!?!?! Now that the outfits have been chosen, Mummy makes sure that I have a few blankets for nighttime…a favorite toy…some pajamas…my own little towel for quick clean-ups (I have a personalized travel towel made by “Pawsome Dogz”)…and of course my First Aid Kit that we discussed in “Traveling With Your Doggie…Part 1.” Moving on to grooming…I have my own grooming kit with comb, brush, scissors, rubber bands for my pretty top knot and hairspray to keep fly-away hairs under control. Mummy will take a small bottle of my favorite doggie shampoo and conditioner too. I have a little bottle of my doggie perfume, a toothbrush and toothpaste and some eyedrops…in addition to a few baby washcloths for daily face cleanings. Paw wipes are always essential when traveling in the city…the streets are so dirty and Mummy doesn’t like me to get my dirty paws in the bed without cleaning them first. Usually she will place me in the bathroom sink and wash them off with soap and water because the street dirt is often too much for even the paw wipes to handle…but they are nice to have for quick clean ups! I like the kind made by “Herban Essentials”…they make a special kind just for doggies that are scented with lavender…I sell them in my new boutique if you are interested in trying them. They are the only paw wipes that I use. I almost always need a bath at some point during a vacation because Mummy likes to keep me so very clean, especially since I sleep with her and she allows me to get on the furniture. She is very careful to take care of the hotel furniture just like she takes care of our own…and she wants me to be super-duper clean. The problem is that not many hotel rooms have TUBS anymore and the sinks are getting smaller and smaller and there is nowhere to BATHE ME! I now have the perfect solution for sale in my new boutique! It is a collapsible tub than folds flat and stores in your suitcase! You can fill it up in the shower and bathe your doggie right there in the shower…when you are done…just pull the plug! This is a wonderful discovery and the perfect bathing solution for us. Take a look at it and see if this might help you out…I know it helped US! The food and snacks are next on the list. Mummy cooks for me and it is hard to travel with prepared food, so I also like to eat the “Stella and Chewy” dehydrated raw disks. They are perfect for travel and can be re-hydrated with warm water…mixed over some kibble and I am good to go. I also like a little strained organic baby food veggies on my dinner…so Mummy can pack these along too and add them to my meal. Of course, there are Deli’s everywhere, so we can always stop in and pick up a few slices of roast beef or ham to tide me over. A bag of my favorite snacks is also packed…this is a MUST HAVE! Mummy packs my little travel bowl and a little tiny plastic mixing cup to mix up my dinner, along with a little spoon (those are hard to come by in some hotels that don’t have restaurants in them…so bring a spoon!) A little travel water bottle will also come in handy for long days outside…Mummy uses syringes filled with water for little me. They are easy to carry and easy to refill…but with a larger doggie, you will need a big travel bottle with an attached bowl. Another great discovery we have come across is to get those little flexible silicone cupcake liners…the ones you get from the baking department at the craft stores. They come in several colors. You can just fold them up and stuff them in your pocket, purse, console of your car…whatever…..and when you need to give your pup some water, just pull it out and you have a little makeshift dish! Now how cool is that???? Another necessary item, especially for hot summer months is a cooling pad! These can be bought from many pet shops or you can make them yourself by freezing water in a thin layer inside freezer baggies and then double bagging them to prevent leakage. When you leave for the day, place these cool bags beneath a blanket in your doggie’s carrying bag or stroller to keep them cool. If you don’t have a freezer in your hotel room….put them in the refrigerator and just bring chilled pads…cool pads are better than nothing….but they will keep your doggie cool in the heat! Last, but certainly not least…make sure you have your current vaccination records from your vet with you. I keep mine in my little travel carrier so it is readily available should someone ask for them. You will also need a small tote bag to carry your doggie around the city if you are traveling with a small dog. Be aware that if you are using the subway systems, they like for you to have your doggie zippered up inside their bag…but sometimes Mummy doesn’t have a zippered bag with her and she just makes me lie down REAL LOW in my bag so noone sees me! But you are SUPPOSED to have them “contained” in their bag when on the subway systems….blah blah blah. I’m ready…I’m packed…I am a world traveler and I love every minute of it…mainly because I just love being anywhere that my Mummy is! Have fun…wherever the road might lead you! 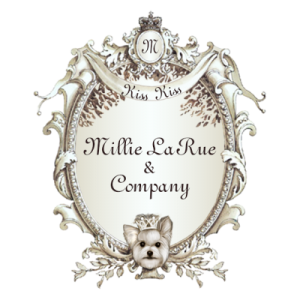 This is my first visit to you blog Millie! Thanks you for all the great info ! 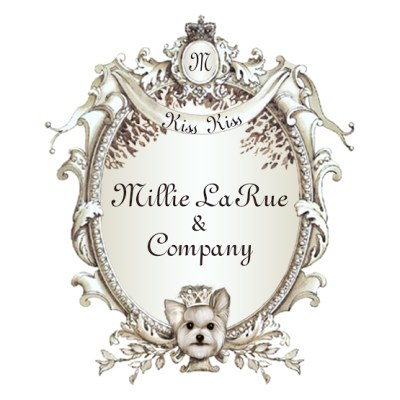 You’re a world traveler indeed, Millie LaRue. I follow your advice and have a wonderful time wherever I go.